Cameron Johnston is living the dream, having signed his first book contract with Angry Robot. He’s a Scottish writer with an interest it all things sharp and pointy and metal and medieval, ancient places and archaeology, RPGS and board games. I got the chance to ask him a few questions right around the time his new book, The Traitor God, was released. The sequel God of Broken Things is coming just around the corner too! NE: Wow Cameron, I’m really excited for your book release! It’s a huge accomplishment to become a published author. How did you get here? CJ: Thanks! It’s been a long journey to get here. Over the years I wrote a number of novel beginnings that ended up being abandoned. Mostly because I had no clue what I was doing and found it getting bogged down with my own frustrations. Then I put in the hard work and completed a novel, and then another. But the writing was just not of the sort of quality I would read in, say, a Robin Hobb book. So I decided to get good, and joined a local science fiction writers’ group. I held off on novel writing for a year or two and focused on writing a bunch of short stories – which don’t hurt as much as a whole novel when you realise it’s garbage and you have to bin it. I learned to critique other people’s work, tried writing new things in new ways, learned editing skills, became a better writer, and then it was time to get back to writing another novel! It seems to have worked out well. NE: When you first started writing, what inspired you to do it? CJ: It’s all down to the story. Even when I was little and playing with Transformers toys and LEGO I used to create elaborate sprawling stories, and usually a tragic heroic death to go with it. I loved comics and books and discovering the wealth of imagination and adventure contained within those pages – authors were small gods creating amazing worlds to me, and I was far more interested in that than, say, sports. Eventually I thought I could probably write down some of my own fantasies. In some ways the feeling of imaginative invention and discovery has not changed at all, it just takes far longer to put it all down on those blank pages. Instead of discovering new worlds written by others I am voyaging through my own imagination. NE: Tell me about your fascination with history and archaeology. Has it helped your writing? CJ: Immensely. I’ve always loved castles, stone circles, old bridges and churches. Ancient places have that thin feeling that makes you feel you can almost reach through and touch the other. That magical, mysterious feeling of wonder has never left me and most certainly influences how I write about such places in my fiction. History and archaeology make me think about and imagine life in the past, and if you are writing about pre-modern fantasy worlds that offers a wealth of information to draw from: from how tanning works to ancient medicine and arms and armour. NE: There’s a lot of ideas out there about what reading is– it can be anything from pure entertainment to deep and thought-provoking, an emotional outlet to cutting social commentary. Is there anything specific you hope your readers will get out of your books? What kind of goal did you have in writing The Traitor God? CJ: What goal did I have? Honestly, it was because I thought it would be fun to write. It’s common writing advice to write the story that you want to read, so that’s exactly what I did. I think on one level it’s a slightly unusual beast of a novel, a dark and gritty second world urban fantasy with huge influence from old pulp swords and sorcery stories and I hope the mix feels fresh and new in some ways. One thing I also wanted to include in this novel was as a reaction to all the gritty low-magic settings – the world of The Traitor God is high magic with awesome magical might and horrifying monsters between the pages. It was tremendous fun to write, so I hope it’s just as much fun to read. There’s also a social and mental exploration of Edrin Walker’s magic as well, which I feel is something very cool about fantasy novels in that they allow us to explore these kind of ‘what ifs’. NE: Where did you get your inspiration for Edrin Walker in the Traitor God? CJ: The whole book originally started off as a short story. I wanted to write a second-world film-noir inspired fantasy story about a (sort of) detective with magic. Something like John Constantine from Hellblazer crossed with a pulp swords and sorcery setting of dark magic and monsters. I wanted some unusual powers that would be fun to explore, and something to make him feared, and I came up with the idea of a mage who specialises in manipulating the human mind. NE: I’m about half way through the book, and the magic you’ve invented is definitely a cool hook! I’m sad to say, I think that wraps up our interview. Do you have any parting advice for young people thinking about trying to break into writing? CJ: Writing does not have to be a lonely business, especially online. Join forums and groups, read other people’s writing and help them improve it, have them read yours and offer suggestions. Read, research and try and get better. It’s a marathon not a sprint, but if you are anything like me and put in the effort to become a better writer, the day will come when you look back at your old writing and see just how far you have come. That is a wonderful feeling. NE: Thanks Cameron! 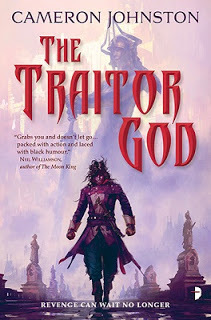 Cameron’s website is here and his book the Traitor God is available here on Amazon. 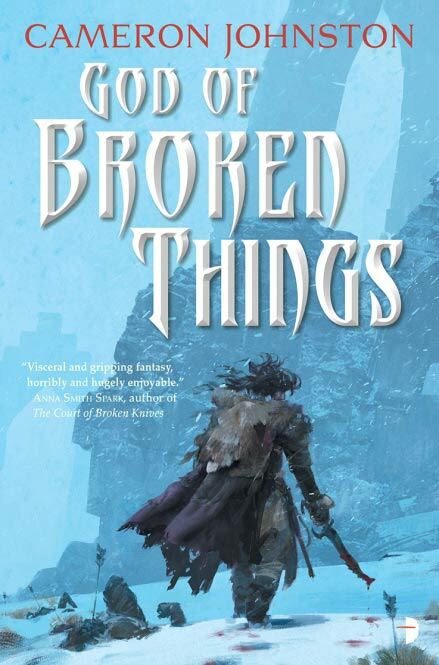 If you want even more of Cameron’s Age of Tyranny series, check out the God of Broken Things.